I have received some unflattering feedback that I made this post so succinct that I squeezed the life right out of it! (Thank you for gently letting me know.) Rather than rework it directly, I have attempted to reconstitute it at Protective Tribes, feel free to go there FIRST! I attended the Lab Automation 2011 conference in which a number of speakers addressed their experiences with collaboration platforms. Although segmentation and specialization are not new to industry (see Scientific Management), research and development activities have retained craftsman-like approaches because of the need for pattern recognition in problem solving and innovation. Traditionally, within a narrowly defined research area, one or very few steward experimentation, analysis, and the accumulation of structured knowledge. However, more and more, segmentation and specialization are being deployed upstream of manufacturing changing the dynamics of pattern recognition and the accumulation of structured knowledge. In fact, speakers at the conference described harnessing automation, outsourcing, and scheduling to fuel faster innovation across agri-business, pharmaceuticals, and disease research in ways that startled even me! Impatience (adoption is slow and is thus a long haul effort). Distilling the different observations and experiences, I conclude that the accelerating shift to a collaborative culture of linked segments requires a deliberate long-view transition with special attention to interpersonal behaviors. It is not enough to add the new collaborative tools into the organization along with automation and segmentation, but requires an integrated program that addresses commitment, valuation, and known obstacles for success. Are you deliberately moving towards linked segments? I recently had the pleasure of hearing David Brooks speak about politics and his career as a journalist (now for the New York Times). He was both funny and insightful. Mr. Brooks spoke on many subjects, but I was especially piqued by his observations about one specific character trait that makes President Obama unduly effective in his role as leader – extraordinary CALMNESS. When Obama debated McCain in the 2008 presidential election, each man took turns at the lectern. Both could be seen writing notes onto the provided notepad. An observer later collected those notes. McCain’s notes were jotted words topical to the debate. 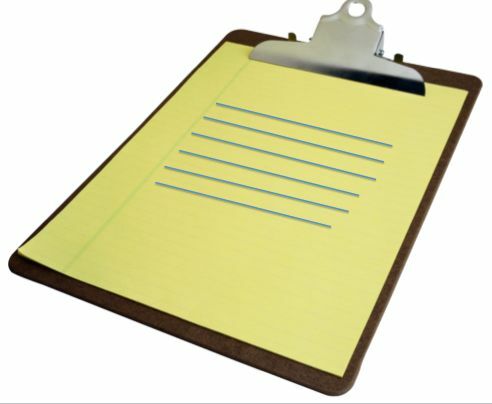 Obama’s notes were six extremely straight drawn lines. I deeply appreciate those who have mastery of calmness because I am personally a hyperactive, difficult to sit-still person. Yet I recognize that calmness is an essential ally in gaining mastery over new material or terrain. It is easy (and natural) to panic when a situation seems overwhelming and futile. However, panicking never breeds success. Breathe deeply through your nose (channel straight lines) – it helps to retain focus and minimizes irrational thoughts about quitting. Break down the problem – try simpler versions to validate the strategy or idea before incorporating into more complex scenarios. Ask for help – consult someone more knowledgeable and learn from them. Although #2 (teach oneself) enables deeper learning, don’t wait too long to seek #3 (learn from another), because of #1 (irrational thoughts). Would you benefit from channeling straight lines? It’s easy to benchmark size when rating performance – it is visible and typically easy to measure. Yet other less accessible attributes can contribute importantly to success: agility, competence, experience, focus, knowledge, patience, skill, strategy, etc. Because these other attributes are less visible and are harder to assess, we often choose to measure on the basis of a simple benchmark like size. In the case of sports, bigger players benefit from their size on two counts: 1) they are physically more powerful and 2) youth coaches often select larger players over their smaller teammates on the reasoning “you cannot coach size,” and give them more opportunity early (for example, more playing time on game day). 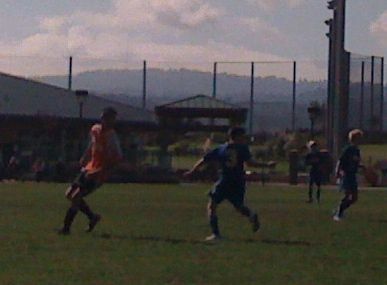 However, having more diligently watched the dynamics of my son’s development as a soccer player a few more months, I now realize that being small (for a longer duration) is only a near-term disadvantage in terms of opportunity (passed over for the boys who have grown bigger earlier). In subtle ways, smaller boys, like my son, benefit from their size disadvantage over the long-term because they cultivate their game differently. For example, my son has impressive knowledge of the tactics and strategy of the game. His skill, agility, and speed are his primary tools for success (different emphasis than his larger teammates). When he finally achieves improved size parity within the next few years (he has more growth left than those who have grown early), perhaps like Lionel Messi, he will still be reasonably competitive due to his quiet mastery of the less visible attributes of the game?! Cultivate more complex thinking for improved accuracy (include more attributes in mental models). As a result of my agitation, I paid greater attention to the team dynamics, learned much, and now realize that it is all part of the beautiful game. Are you constantly expanding observations, increasing knowledge, and cultivating more complex thinking everywhere? There are many things that fall into the works-for-me category: my husband, my friends, this blog, yet I choose to celebrate this milestone with a post about my long-term love affair with my Terry Bicycle Pro Racer Skorts. I bought my first Terry skort about ten years ago. I loved the fact that I could act pretty unladylike yet still look ladylike! I have been collecting them ever since at a rate of about one per year. At this point, I have a terrific collection of brightly colored prints that are fun, uplifting, and playful. To date, I have eleven skorts (including a plain black one, not shown in the photo whirl). I share this whimsy, not because I need to have them validated by others, but rather it just happens to be a great example of something that works so well for me that I am planning to continue. The combined knowledge that I receive many compliments and that my teenage daughter tells me regularly that skorts are ugly and horribly out-of-style, ever encourages me to carry on with my non- mainstream skorts. Could it be any other way?! Although, I’m the only one at my rock climbing gym to wear skorts, everyone can readily identify me from the others: I am “Skort Linda.” Have you seen me? While I await the 2010 collection of Pro Racer Skorts…Are you keeping what works for you? I was recently involved in a recruitment dance at a small biotech ready for manufacturing scale-up. The organization had some very interesting and valuable technology and was looking for someone with mastery in manufacturing scale-up (me). Initial impressions suggested an excellent match to my skills, interests, and passion. I talked to the organization a few times over the course of several months. Although I was in no hurry to find my next full-time professional adventure, I was delighted to be considered for the position and was eager to get traction if there was to be a successful match. At my last meeting, I met with a recently hired executive that assessed my ability to fit into a start-up culture. He emphasized and reiterated the urgency of the scale-up effort, suggesting only weeks remained before a crucial deadline. How would I handle that pressure? I answered his questions truthfully: I am not a miracle worker, but I am extremely competent with a track record of success even under crisis conditions. He thanked me for my time and promised to get back to me by end-of-day and no later than end-of week. A week came and went and there was no follow-up, so I sent a brief email requesting an update. What followed was a series of emails trying to set a time for a phone call. By the third email, it was quite apparent that my candidacy for the position was not a priority. Although I am confident that I could have helped them technically, I finally realized that I was not a culture fit for their organization because I was frustrated that their actions were incongruent with their words. How could they claim excessive urgency for technical scale-up deadlines yet be so delayed in getting back to candidates necessary to meet the deadline? This example, was one of several examples of inconsistency that could be rationalized singly, but together created a sense of pervasiveness. Harmless/Intentional Incongruence that is part of comedy. In this context, incongruence works because it is intentionally funny. An example is the intentional incongruent dialogue and props in the performance of Monty Python’s Spamalot. Similarly, my accompanying photos are funny because they are incongruent. Annoying/Incomplete Design Incongruence that is an omission of an overall review of the customer experience. An example is the mixed use of manual and sensor-based equipment in the ladies’ restroom at my local mall. The toilets flush by sensor, the soap is dispensed by sensor, and the towels are provided by sensor. However, the water is delivered from the faucet by turning the knob. I no longer recall how many times I (and others) have felt like an idiot waving my hands under the faucet trying to make the water come out then realizing that I need to turn the handle! This situation is just an annoying omission, no one really thought about how a customer would experience the facility after several sensors have been presented – we expect sensors for all interactions. Damaging/Short View Incongruence that results from mixed messages. An example was my opening story. Create priorities and communicate them profusely. Strive for consistency and congruence in your messages (story) and be aware of the potential for misunderstanding. Be intentional with your actions; actions speak louder than words. It was emotionally hard to call and decline the technical opportunity with that small biotech because I had already imagined success on their behalf and I felt invested. However, because I sell process confidence* (requires congruence), I declined the opportunity. I wish them a successful future and I will keep looking for the right fit for my next adventure! Does your story match your actions/behaviors? Relativistic comparisons: “How people feel about their situation is highly dependent on comparison to others. Thus, in order to achieve good staff (team) morale, it is important to consider how to minimize negative comparisons now *and* in the future.” (Relativistic Comparisons, blog topic from last week). Learn the strengths of the individuals of your team and leverage individual strengths to achieve team goals. Be fair from the perspective of your team. Be clear on expectations, reward excellence, and avoid marginalization. Strike a fair balance between competing goals and demands of multiple masters. Be fair from the perspective of your customer (whoever pays for the service is the customer). Be clear on deliverables, achieve excellence in customer service, and respect tiered pricing. This past weekend, I found myself observing these leadership principles in a very different domain than technology development. I felt them as a soccer mom. The goals of a U14 (under fourteen) Class 1 (highly competitive league) are twofold: win games and develop players. 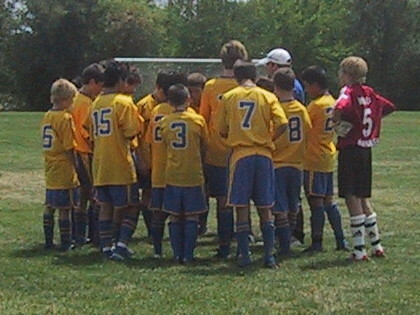 A soccer team fields 11 players at a time, but carries a roster between 14 – 17 kids to allow for substitution (rest and injury). The coach’s leadership job on game day requires allocation of playing time to effectively win games and develop players. Players sitting on the bench do not develop (get better), but playing the strongest players improves the odds of winning games. This creates the inherent tension between the two goals (win games vs. develop players) with “playing time” being the valued (and measureable) scarce resource. Although my son is an excellent soccer player, combining speed, agility, and accurate ball placement, he is small of stature and is considered less aggressive than some of the other boys. He follows the expectations set by the coach and works hard to receive as much playing time as possible. He is loss averse to playing time both because he recognizes the vicious cycle of dis-improvement and because he feels “unfairness” (relativistic comparison) when the other boys receive substantially more playing time. With each successive “loss” of playing time he is further marginalized, thereby jeopardizing his love and passion for the game – a serious long view consequence of many small seemingly insignificant slights. 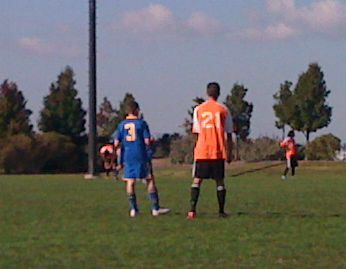 My son’s soccer team traveled over a hundred miles from home to play a several day soccer tournament. Since not all team members could attend the tournament, extra players were recruited to “guest” at the tournament for the team. The team had 16-18 total players available for the tournament games. My son averaged 12.5 minutes of playing time per game (25% of 50 mins/game) with ZERO in the semi-final. Guest players each received substantial playing time (>75%) in all games including the semi-final. It was a very unpleasant 2-hour ride home after the loss in the semi-final. Although I am confident that my perspective differs from those who received adequate playing time because they did not suffer marginalization – they have the perspective of “gain” whereas I have the long perspective of “loss,” a line was crossed that prompted me to write this blog post. Marginalization was allowed. Receipt of ZERO playing time in a semi-final is a vote of “no confidence” and is severely marginalizing in the context of the guest players receiving substantial playing time (relativistic comparison of scarce resource allocation). Tiered pricing was not respected. Although everyone incurred (equivalent) travel expenses, the guest players, who received “free” coaching and tournament entry (those fees were paid by the team) were treated the same as paying players. It would be reasonable (to me) to defer to those players who bear the costs of the salary, expenses, and tournament entry to ensure principle #1. Planning was insufficient. If principles #1 and #2 are compromised, then #3 is insufficient. Planning is the big differentiator for long view leadership success – if you plan for contingencies you can and will overcome instinctual tendencies. Acknowledge error to my son and commit to move forward positively. Explain to my son that the team fit is no longer correct and then offer to help place him on a team that will value him (before we pay the $1400 fee for the fall season!). I am not sure that will happen spontaneously. I would love to be able to Teach Concepts, Explain Specifics, and Gain Acceptance (Relativistic Thinking), but I am not the one with the relationship with the coach. Can a 13-year-old navigate this effectively? What is your perspective? Do you have advice? I just finished reading, “The Time Paradox: The New Psychology of Time that Will Change Your Life” by Zimardo and Boyd. It hasn’t changed my life, but it definitely gave me insight. Irrespective, it is a worthy read. Before I began reading, I took the online Zimbardo Time Perspective Inventory (ZTPI) and discovered that I am an off-the-scale futurist scoring a whopping 4.92 in the future perspective. On all other time perspectives, I am at or below average. The description of the “Future-Oriented Person” closely describes me (dominant in concern about long-term consequences, able to sustain the unpleasant for future benefit, health conscious, goal-oriented…) – how scary is that?! Perhaps that explains WHY I have a blog titled the LONG VIEW! The basic point of the book is to get Futurists to be more Present and Past/Presents to be more Futurist – we all need balance. Indeed! The good news for me is that Futurists tend to be very successful in business because they are well equipped to deal with the complexities of the modern world. The bad news is that Futurists tend to have less joy because we undervalue pleasure – work first, then play (if there is time). The best news is that I didn’t need the book to get me going to achieve balance! Over the past many years, I have been actively working to Be Present much more – to enjoy the process, the road, the flowers along the road, and my traveling companions. The authors reinforce that great leaders are engrossed in the Present. Are you working to achieve balance? Is joy on your priority list? Rachel Alexandra, a girl horse, won the Preakness Stakes, the 2nd leg of the Triple Crown of Horse Racing this past Saturday! It hasn’t happened in 85 years. Part of long-view thinking requires identifying, being present, and breathing-in moments of inspiration to launch and sustain transformation. The achievement of Rachel Alexandra is one of those rare inspiring events. I was paying attention (and cheering) when Title IX was passed into law (1972) and when Billie Jean King trounced Bobby Riggs in the tennis “Battle of the Sexes” (1973). At that time, I imagined the transformation of our world to largely what we have now – women participating, competing, and being taken seriously in many, many sports, just like the men. In 1977, I was the first girl in my high school to be allowed to take weight lifting for P.E. credit instead of the expected volleyball. I recall that the coach agreed to give me an “A” if my cumulative total for the three defined lifts: squat, dead lift, and bench-press, was three times (3x) my body weight at the end of the program. The boys needed a cumulative total that was five times (5x) their weight for an “A.” Although it was probably a fair accommodation considering that boys are stronger than girls, I wanted to be taken seriously. I set my goal at 5x in three lifts. I am grateful to have been inspired by the birth of equal opportunity athletics and to have participated in nurturing and sustaining the transformation. Woohoo, Rachel Alexandra, you go girl! I am a voracious reader; typically I read a few books a month. 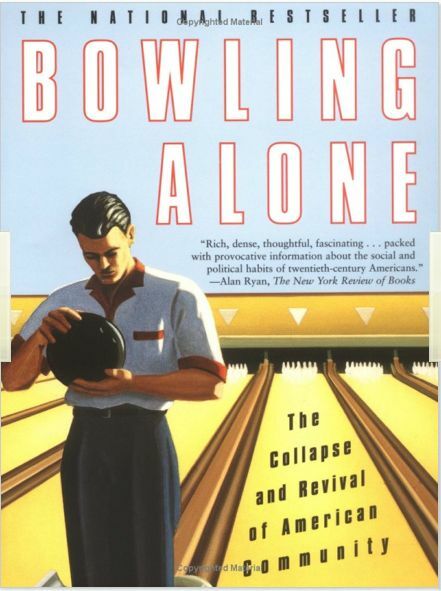 I started Robert Putnam’s “Bowling Alone: The Collapse and Revival of American Community” on 03/06/2009 (the day I checked it out from the library). I renewed it once and then ordered it from Amazon when I realized that I wouldn’t finish before I had to renew it yet again. My long view journey with this book began with the question: “What to change in the workplace and in the community to increase collaboration and to reduce feelings of isolation?” This question arose from my observation that the world is changing as a result of our adoption of technology (this is a good thing), yet it affects both workplace and civic communities in ways that make it harder in many cases to be effective because of concomitant rising expectations. My key observation was that each of us has many demands on our time (more and more), making it harder and harder to get people to collaborate (workplace) and/or connect (civic) face-to-face (the old way) because we need lower transaction costs to do more and remain effective. The good news is that technology is lowering transaction costs everywhere – Clay Shirky in “Here Comes Everybody: The Power of Organizing without Organizations” makes the point very effectively (if you don’t want to read this book, let Steve read it for you). As lowered transaction costs permeate our lives, we begin to shy from activities that exceed a certain threshold of time (or effort) because we require reduced transaction costs everywhere (lowered tide lowers all boats) in order to participate. Weighing in at only 414 pages, “Bowling Alone” was a dense and demanding read — chock full of statistics and data of all sorts. It required slow absorption, but I learned much! On page 335, I hit resonance. Putnam summarizes that many of us in modern society feel down because we have a stronger investment in our own autonomy than commitment to duty and common enterprise, thus leaving us unprepared to deal with the inevitable setbacks, losses, and outright failures that are part and parcel of commercializing emerging technology or just living life! In prior eras, the commitment to duty and common enterprise was stronger than personal achievement (flipped balance), enabling a stronger network of family and friends (social capital) to be available to cushion our dips. Although the shift from community to autonomy created a reversal in the strength of our personal connections, it was accompanied by the strong positives of greater diversity and tolerance (gender, race, religion, orientation). Thus, I celebrate the era of self-determination, meritocracy, and achievement through perseverance; yet as a leader (workplace and community), I look for guidance as to how best to ignite greater connection (social capital) in our transformed world. I desire self-determinant workplaces and communities that create much more needed human camaraderie to re-balance toward the common good. Putnam’s guidance is sparse, but positive. He does not tell us what to do, but gives us direction for solution: we must build mechanisms with our new tools (reduced transaction costs) to create (more and more) reciprocity, trust, and mutual aid. Putnam makes the point that during the Progressive Era (following rapid industrialization), reformers of social capital then were activist, optimistic, and hugely successful by using the new tools of their era. How best to accomplish this mission?! Do you have ideas? There is just something about gadgets that I love. I love the innovation and the potential for transformation that they represent. With each new gadget, I buy into the story that it will somehow improve my life: save me time, make my experience more joyful, or reduce the tediousness of tasks. Emerging technology represents the same potential for transformation, yet must be nurtured to successful commercialization. Processes need to be developed ensuring that robustness and customer satisfaction are built in. With the love and devotion that I give my gadgets, it is such a disappointment when a favored gadget fails. Yesterday, one of my favored gadgets, the Max Stealth Tire Minder pressure gauges, failed. My car had a completely flat tire – not a little low, but completely flat! Naturally I assumed that I must have picked up a nail on my last trip. 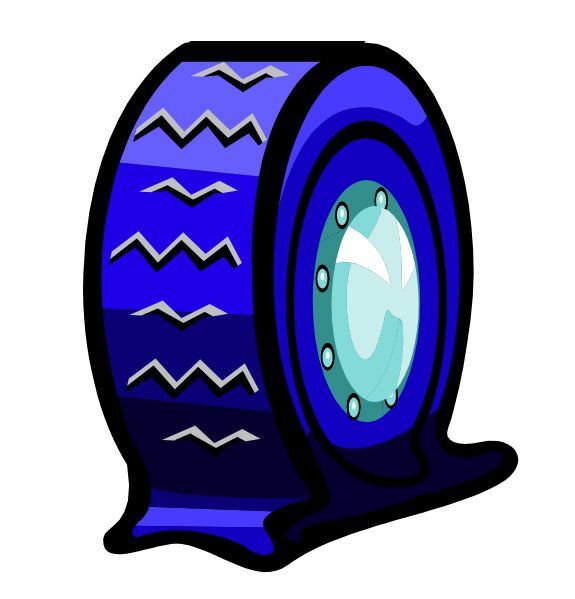 Maybe because I wanted to believe that my Tire Minders were robust, it never occurred to me that they failed (even though it happened once before a few years ago). So, instead of pulling out the compressor, I dutifully pulled out the jack, collected the tire wrench and changed my tire. Although I couldn’t see the failure point on the tire, I took the tire to the shop this morning to get it fixed. My tire dealer assured me that the tire was fine, but my super-hooty-doo tire stem pressure gauge indicator was the culprit. Aargghh, the indignity of it all – I believed in them, loved them, and told all my friends how neat they were – I feel betrayed! I sold myself the storyline that I saved time while still ensuring that my tires were properly inflated (saves gas!). Each time I filled up, I didn’t have to drag my pressure gauge from the glove compartment to check my tire inflation. All I had to do is just walk around the vehicle and look for the “yellow” indicator to see if a tire was low. As it turns out, all that accumulated time that I saved not using the regular tire gauge evaporated with the time it took to change that tire, take the tire to the shop, and then wait to have the shop “fix” it. Was it worth it? Well, the fellow at the tire shop told me that he sees lots of failures and fine print indicates that they are warranted for a year. I bought them exactly one year ago, when I purchased my tires – how did they know a year was up?! Even though Tire Minder is neat, it is not robust enough to create my satisfaction over the long view. That being said, I will continue to try new technology and innovations, because over the long view that is how we achieve progress. This story just provides another reminder of the importance of building robustness and customer satisfaction into innovative products (and emerging technology) to ensure successful adoption (and commercialization).